These plastic binding combs are a bright and vibrant red. This shade is probably the first you think of when the word "red" is heard. Books made with these red combs will be noticed and that is exactly what you want, right? These binding combs can fit any sized project up to 425 pages, ranging from 3/16 of an inch to 2 inches. The 19 ring design is standard and fits most comb binding machine and 8.5 x 11 inch paper. Plastic combs are designed to lay flat in both an open and closed position. Our binding combs are made not to discolor, chip, or peel so your binding will be looking good for some time to come. Standard length of 11" for 19 hole comb binding. 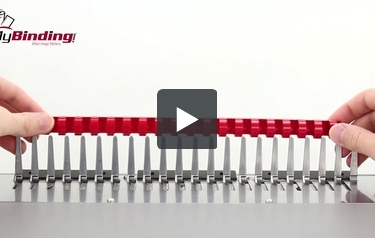 Glossy Red plastic binding combs complement your covers for a professional appearance. Welcome to MyBinding video. Binding combs can have many more uses than just holding paper and with red, you can tell your team beforehand, was this a bad month or a good month? Ranging from 3/16" to 2", there's a comb for any sized project. Not only do these smooth red plastic binding combs say a lot, they're great for the day to day project. The 19-hole punch pattern is compatible to fit any standard comb binding machine and it's use with 8 1/2 by 11 inch paper means that anything you print, you'll be able to make into a book. Depending on your choice of size, you can fit from 1 sheet to 425 sheets of paper for your next project. They're made to last the test of time. They won't scratch, chip, peel or discolor. Proper use allows for pages to flip easy and lay flat, making reading a breeze and allows for getting the right margins for photocopy. For more demos, reviews and how-to's, go to MyBinding.com.